Ready To Move Into Your Perfect Home? You shouldn’t have to settle for an uninspiring stock home. 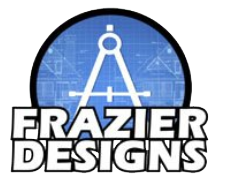 Frazier Designs will design the home of your dreams. We provide custom home and architectural design services in Fayetteville, Wilmington, NC. Our team pays close attention to detail on every project. We enjoy getting to know our clients and helping them flesh out their custom house plans. You can trust us to help you be budget-conscious about your choices so you won’t have to empty your savings on your new home. Call 910-818-2413 now to schedule a blueprint design consultation in Fayetteville, Wilmington, NC. Click here to see why we're a preferred home design company. Choose us for first-rate architectural design services. Find out what Fayetteville homeowners enjoy about our services. See our past projects to get inspiration for your custom home. We'll hold a free initial consultation with you to go over your residential design ideas. We'll also discuss the prices with you to see if you want to move forward. We'll schedule a follow-up consultation to break down the project timeline. We'll send the blueprint design to your builder to get the ball rolling on your custom home. Are You Ready To Build Your New Home? Copyright © 2019 Frazier Designs, all rights reserved.